I've been trying to be nice lately. I don't think that I'm normally not nice, but there are times when I think I could be nicer or make more of an effort. As a shy introvert, it can be hard for me to make that leap and contact someone I like but don't know very well and say "Let's hang out!" (heck it's hard for me to do that with people I do know well), or even do small things like tell a stranger they have toilet paper stuck to their shoe. I have this preconceived notion that doing the nice thing ends up being more awkward than not doing anything at all. Path of least resistance and all that. I've been folIowing that path for too long...I need to forge a new path. Yesterday was administrative professionals day, and instead of wondering if anyone was going to do anything for our department admin I decided to take it upon myself and get her some flowers. I figured if someone else did something too, then she'd just feel extra special, not a bad thing, right? I showed up at work with a big pot of flowers and I even made a card, and then noticed she's wasn't at her desk. Maybe she was in a training or coming in late? A few hours later, still not at her desk. I knew she was going out of town near the end of the week, but didn't think it was so soon. I finally decided to check the e-mail she sent out last week, and it turns out she was probably on a plane that very moment. D'oh. 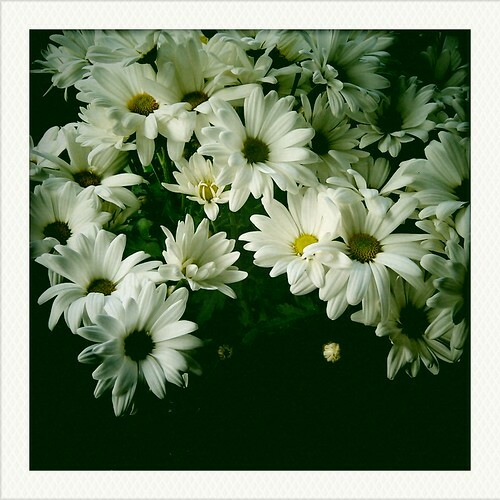 So now I've got a pretty pot of white daisies sitting on my desk until she gets back next week. So, not a bad thing. But I'm thinking I might need a little more practice on this being nicer/extra effort thing. \n\n\nI've been trying to be nice lately. I don't think that I'm normally not nice, but there are times when I think I could be nicer or make more of an effort.\n\nAs a shy introvert, it can be hard for me to make that leap and contact someone I like but don't know very well and say \"Let's hang out!\" (heck it's hard for me to do that with people I do know well), or even do small things like tell a stranger they have toilet paper stuck to their shoe. I have this preconceived notion that doing the nice thing ends up being more awkward than not doing anything at all. Path of least resistance and all that. I've been folIowing that path for too long...I need to forge a new path.\n\nYesterday was administrative professionals day, and instead of wondering if anyone was going to do anything for our department admin I decided to take it upon myself and get her some flowers. I figured if someone else did something too, then she'd just feel extra special, not a bad thing, right? \n\nI showed up at work with a big pot of flowers and I even made a card, and then noticed she's wasn't at her desk. Maybe she was in a training or coming in late? A few hours later, still not at her desk. I knew she was going out of town near the end of the week, but didn't think it was so soon. I finally decided to check the e-mail she sent out last week, and it turns out she was probably on a plane that very moment. D'oh. \n\nSo now I've got a pretty pot of white daisies sitting on my desk until she gets back next week. So, not a bad thing. But I'm thinking I might need a little more practice on this being nicer/extra effort thing.